Our custom printed paper straws Are biodegradable and eco-friendly. An environmental turning point in drinks is coming and activists are fighting against the use of plastic straws. It was all brought to a head recently when a video of researchers pulling a plastic straw out of the bloody nose of an endangered sea turtle went viral. Environmentalist groups estimate we use more than 500 million plastic straws every day in the U.S. As the tide shifts against plastic straws, plastic manufacturers continue to stress recycling but no one has come up with a good solution for recycling single use plastic straws and even the new “bioplastic” plastic straws but bioplastic straws aren’t as eco-friendly as the public thinks and end up in landfills due to polylactic acid in them which can only decompose in an industrial composting facility. As for plastic recycling in general, of the 6.9 billion tons of plastic waste ever created, almost 80 percent of it has ended up in landfills or the environment. McDonald’s announced it would switch to paper straws in all of its 1,300 U.K. locations starting in May. Stores also will keep straws behind the counter, and customers will have to ask for a straw if they want one. There chains are also expected to be moving away from plastic straws in the near future. And, many cities in the US are banning plastic straws including Seattle, Fort Meyers, Malibu and others which have banned restaurants from giving them out. 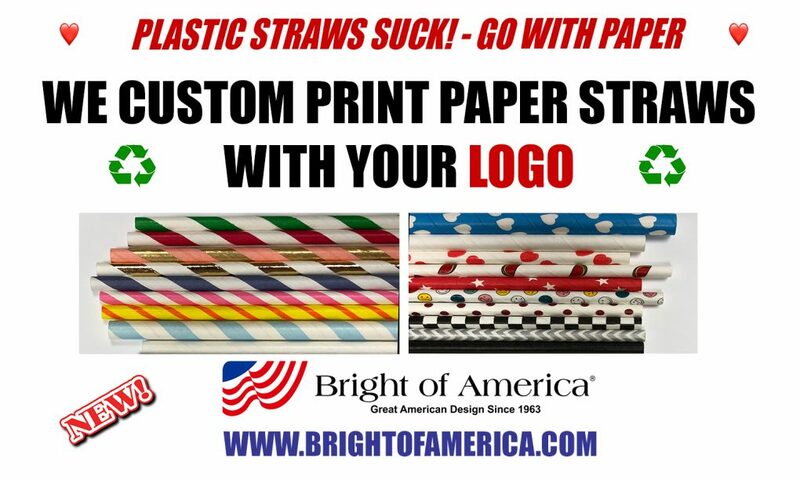 The best idea is custom printed paper straws with your logo on them and suddenly you have a festive, promotional item that can be tossed in a home composter after a party or take out meal or recycled directly at the point of purchase. For now, the eco-friendly consumer options remain limited and the best overall option is custom printed paper straws which can serve as a promotional tool and a signal to consumers that your company is environmentally focused. Contact us today to explore the options for custom printed paper straws. Currently we are offering diameter (6~12mm) and length (215~257mm) with unlimited printing options. But hurry…the wave of switching from plastic to paper is gaining steam! EVER WONDERED HOW PAPER STRAWS ARE MADE?